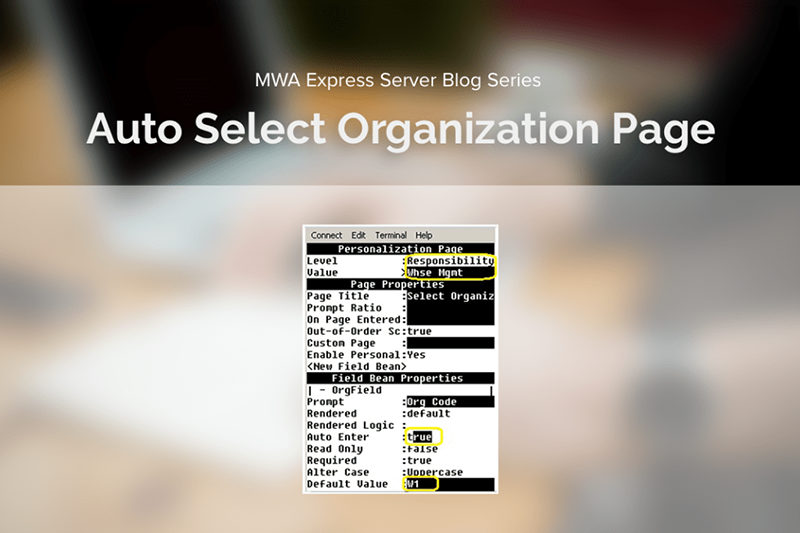 In this series of MWA Express Server blog, we will look at how we can increase user efficiency in the warehouse by auto selecting the organization value in the Select Organization page. This reduces additional keystrokes and chances of user error. By using the MWA Express Server personalization feature, we can personalize the Select Organization page such that default value of an organization can be associated at Responsibility level, User level, or even Site level (if a company has only one inventory organization). In this example, we are going to assume that a company would like to tie it to a responsibility. In other words, when user selects a specific responsibility, the organization will be auto defaulted. This is how the personalization page will look like in this example. So for responsibility “Whse Mgmt”, we will provide a default value of W1 for the Org field and perform an auto enter. By doing this, when users choose Whse Mgmt responsibility and go to a mobile function for the first time in their session, the Select Organization page shows up with W1 auto populated and auto entered. Essentially, user will just skip through the page, going directly to the mobile function. Copyright © 2011 – 2017 Intellinum. All Rights Reserved.